Citation: C N Trueman "The Church in 1547"
historylearningsite.co.uk. The History Learning Site, 16 Mar 2015. 6 Apr 2019. The Church that Henry VIII left Edward VI on his death in 1547 was very different to the Church he had inherited from Henry VII in 1509. In 1509, Henry’s Church was subservient to the Pope. By his death, the Pope had little, if any, authority over a Church that had in 1534 seen Henry place himself at the head of it as temporal head. The king appointed the spiritual head of the Church – so his grip on the Church was very great. The most telling issue from 1534 to 1547 – other than the dissolution of the monasteries – was doctrine. On the one hand Cranmer wanted moderate Lutheran ideas introduced into England while opposed to this were the conservative Catholics, such as Stephen Gardiner, who favoured just minimal changes to Catholic doctrine. Henry swayed between the two. In 1536 the Act of the Ten Articles was passed, which introduced a number of moderate Lutheran based doctrinal changes. In 1539 the Act of the Six Articles was passed, which all but removed these reforms. What this meant in reality was that by Henry’s death in 1547, the doctrine of the Church was a compromise. It contained many inconsistencies, which ironically managed to unite both groups of reformers and conservatives, as they both wanted clarity and consistency (though both in their favour). Many of the day-to-day workings of the Church were recognised as Catholic. Transubstantiation was clearly stated to be the Eucharist as opposed to the Lutheran Consubstantiation. The laity was restricted to taking only the sacramental bread with red wine being the sole preserve of the clergy. The laity was still expected to confess sins and the clergy was no longer allowed to be married by 1547. Any member of the clergy who was married had to send away his wife and children or risk losing his position. Good works was reinstated and the singing of masses for the souls of the dead was held to be “agreeable also to God’s Law”. Therefore, many aspects of the Church had classic elements of Catholicism. However, despite this, the Church did adopt a number of Lutheran practices. While services were in Latin, Cranmer’s English Litany had been authorised in 1545. Great importance was attached to the Lord’s Prayer and to the Ten Commandments – both of which had to be taught to children and servants. The Great Bible of 1539 was the authorised English translation, which replaced the Latin Vulgate Bible. The elite laity was allowed to read the Bible at home, whereas in Catholic Europe only the clergy were allowed to read the Bible. Pilgrimages were outlawed as remission from sin could only come from God and not from taking part in pilgrimages. One of the most potent symbols of Catholicism in England – the monasteries – had been shut down. Therefore, in the year Henry died, the Church was a doctrinal mixture of Catholicism and Lutheranism. Nigel Heard refers to the country as having a “patchwork of doctrines” that were only held together by the treason and heresy laws. 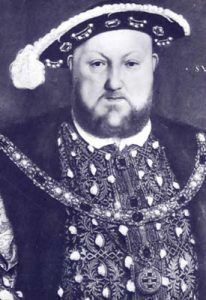 Anyone who questioned doctrine as it stood in the later years of Henry’s reign could face confiscation of property, fines, prison or even execution. Censorship laws prevented the printing and publishing or any material that expressed views contrary to the doctrine of the Church. The punishment for breaking these laws was equally as severe.